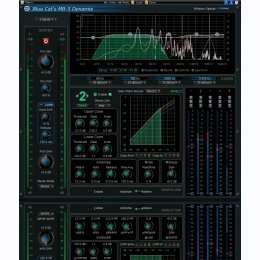 Blue Cat's MB-5 Dynamix is an extremely powerful all-in-one multiband dynamics processor: it can be used as a multiband compressor, limiter, gate, expander, waveshaper or all combined at once, on any part of the spectrum. The unique dynamics processing section of the Blue Cat's Dynamics plug-in has been streamlined and integrated in this plug-in to process each one of the 5 bands separately. The plug-in provides unique envelope detection capabilities that let one band trigger the dynamics response on others (internal side-chain). Combined with the advanced stereo features including mid/side processing and independent channels activation, it gives you full control over the dynamics of the signal for a wide range of effects. An additional brick wall limiter/clipper protects the output for complete control over the dynamics response. The user interface has been designed to streamline the workflow, and despite the wide range of functionalities offered by the plug-in, it is extremely easy to use. Inter-bands controls (copy/paste, link...) lets you create complex treatments with a few clicks. Thanks to its advanced MIDI and automation output capabilities, Blue Cat's MB-5 Dynamix is capable of advanced side-chaining features: you can control other plug-ins with the output of the dynamics processing stage for simple side chain dynamics effects or more advanced signal-dependent effects. Full featured multiband dynamics processor: compressor, gate, limiter, expander, waveshaper. Up to 5 bands, with crossover filters from 6 to 60 dB/Oct for optimal separation. Unique envelope routing capability for cross-band dynamics effects (one band may trigger another). Dry/wet control for parallel processing ("New York Compression"). Complete Visual feedback with real time response curves and levels display. Easy copy/paste settings between bands. Side chaining made easy: a unique way to perform multi-band side chain compression, ducking, gating and much more. Smooth Update: silent (zipper-free) parameters update. No CPU load on idle: when the plugin is fed with silence, the processing smoothly shuts down, to optimize the CPU usage of your Digital Audio Workstation. Real time MIDI control with advanced settings (MIDI channel and CC numbers, with complete response curve control) and MIDI learn. Automation and MIDI output: record output parameters as automation curves or send MIDI CC messages to other plugins for powerful side chain effects. Smooth Bypass: activate/deactivate the plugin with absolutely no noise. Import/Export presets in a host independent format. Microsoft Windows XP, Vista or Windows 7 or 8. Any DirectX / VST / RTAS / AAX compatible host software - 32 or 64 bit. An Intel or PowerPC processor. Any VST / Audio Unit (32/64-bit) / RTAS / AAX compatible application. One single instance of the plug-in per session. The plugin is regularly bypassed for a few seconds.